United States Women’s Selects sealed a 25-24 victory over England National Academy at Newbury RFC on Tuesday. USA held a narrow one-point lead at the break, despite falling 14-3 behind to tries from Bryony Cleall and Georgina Lingham, both of which Ellie Green converted. The visitors fought back through scores from Evan Hoese as well as Joyce Taufa while Megan Foster added five points. Ellie Underwood and Hoese traded tries, while Cortney Kuehl gave US a six-point lead but despite Hannah West’s late score was not enough to overturn the deficit. The England squad combined a mix of pathway players and more established names and were captained by Richmond lock Rowena Burnfield, one of five players with senior international experience. England started brightly with prop Cleall bundling over off the back of a maul, after a penalty had been kicked to the corner and Green’s conversion gave them a 7-0 lead. Foster reduced the deficit with a penalty before England had a second try, Lingham the grateful recipient of a spilled ball inside US’ own 22m and the wing gathered the loose ball to dot down, which Green converted for 14-3. Hoese then jinked through for a first American try which Foster converted and then with four minutes remaining Lingham was sent to the bin for an illegal tackle, which the visitors took advantage of with Taufa bundling over on the stroke of half-time. England were back in front through Underwood, who having gone close moments before, dived over in the corner for 19-15. Hoese had a second, also going over in the corner and Kuehl darted through to give the visitors a 25-19 lead. England laid siege to the US try line in the final 10 minutes and after intense pressure West bundled over for a fourth try, however, Green missed the crucial conversion. England Women’s head coach Simon Middleton paid tribute to his side for their display on Tuesday. 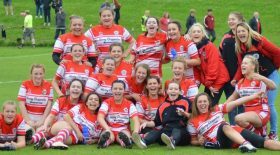 “I’m really proud of the girls, they’ve had one training session together and it’s been good to get them together,” he said. “There were some really strong individual performances and collectively they came together well in periods during the game. “We dominated the set piece, but US were slightly better conditioned that us and looked like they had played together more. “We have a great pathway in place and the national academy bridges the gap between the U20s and the seniors. The development side next take on Canada Women A at Cobham RFC on Wednesday 21 November (KO 7.30pm). 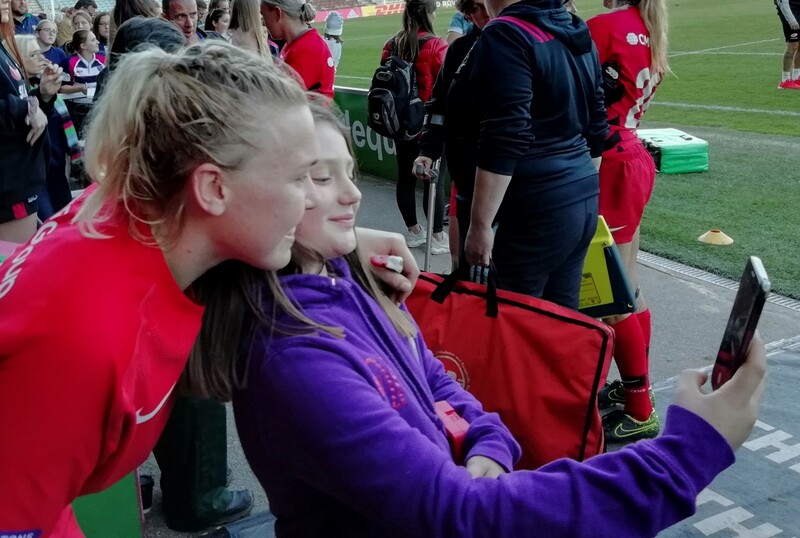 Photo shows Rosie Galligan and fan taking a ‘selfie’.